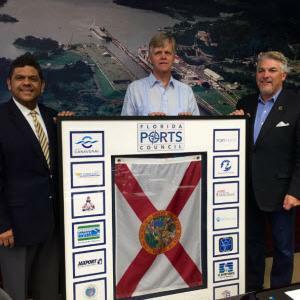 BROWARD COUNTY, FL - Port Everglades and the Panama Canal Authority (ACP) have renewed their long-standing Memorandum of Understanding (MOU) to promote trade opportunities for another five years. This renewal will extend their strategic alliance to 2021. The MOU solidifies both entities&apos; dedication to growth and best customer practices. The ACP and Port Everglades first signed an MOU in August 2009. Areas of cooperation between the ACP and Port Everglades include joint advertising programs, data interchange, and competitive market analyses of the shipping industry. This alliance will also continue to promote the route to the West Coast of South America as well as the "All-Water Route," the route from Asia to the U.S. East Coast via the Panama Canal. The MOU encourages collaboration between Port Everglades and the ACP, which translates to providing our South Florida residents and visitors increased access to the growing global economy," said Steven Cernak, Port Everglades Chief Executive & Port Director. "We continue to share information on our modernization efforts that complement each other and to discuss ways to pursue joint marketing activities." Port Everglades Chief Executive & Port Director Steven Cernak attended the recent grand opening ceremony of the Panama Canal Expansion Project in June. At that time, the Panama Canal Administrator Jorge Luis Quijano provided an update on the Expansion Program and its impact on U.S. East Coast ports. The Canal Expansion drew worldwide attention to the significance of global trade and the critical need for infrastructure investments to handle today&apos;s modern fleet of larger cargo ships. The Panama Canal Expansion involved the construction of a third lane of traffic allowing the passage of bigger vessels, which doubles the Canal&apos;s capacity and has an important impact on world maritime trade. It has been the largest enhancement project since the Canal&apos;s opening in 1914. Port Everglades, a leading container cargo port in the United States, provides service to more than 150 ports in 70 countries and is the number one U.S. gateway for trade with Latin America. The Port has the shortest, straightest entrance channel on the Southeast U.S. Atlantic coast, which saves ships fuel costs and time. The Florida East Coast Railway (FEC) opened an Intermodal Container Transfer Facility (ICTF) on the Port two years ago to provide even greater ship-to-rail connectivity from South Florida to points throughout the United States. Cargo can reach 70 percent of the U.S. population from Port Everglades via rail in four days. More information about Port Everglades is available at porteverglades.net and the Panama Canal Authority (ACP) at pancanal.com. Photo caption: Port Everglades joins the Panama Canal Expansion Celebration in June with Chief Executive Steve Cernak (middle), joined by Port Tampa Bay CEO Paul Anderson (right), presenting a plaque on behalf of the Florida Port&apos;s Council for a presentation to Oscar E. Bazán V., Executive Vice President, Planning and Business Development, Panama Canal Authority (left).